Keong Sim. Photo by Michael Brosilow. If ever there was an appropriate venue for “after the quake,” an adaptation of two short stories by the near-cult status Japanese author Haruki Murakami, it is Berkeley Rep, located smack dab on the Hayward Fault. The fact that the play opened on the anniversary of the Loma Prieta earthquake may just be coincidental. Actually, the play is not so much about those dread tremors beneath our feet as what goes on upstairs in our minds and imaginations. Gentle and fanciful, it may nevertheless shake you up a little. Two-time Chicago-area Tony winner Frank Galati originally premiered his adaptation at that city’s famed Steppenwolf Theater. The show went on to La Jolla Playhouse and Long Wharf Theatre in New Haven. It interweaves two Murakami stories, actually written in response to the Kobe earthquake in a collection entitled “after the quake.” The first frames the real-life action, the second takes place in an imaginary world, created by the shy, inhibited writer Junpei (Hanson Tse, who has been with the production since its beginning). From his college days, Junpei swallows down his unspoken love for the charming Sayoko (Jennifer Shin) and watches her marry his best friend (Paul H. Juhn as the handsome, macho Takatsuki). The three remain close, even after the couple has a child (adorable El Cerrito fourth-grader Madison Logan V. Phan who alternates in the role with Gemma Megum Fa-Kaji of Berkeley). Junpei regards Sala, the little girl, almost as his own, coming out of his reclusive shell to tell her late-night bedroom stories to calm her fear of “The Earthquake Man,” seen in nightmares born of too much watching of television news reports. Here Junpei’s imagination soars; his flights of fancy extending to talking bears and a gigantic, urbane, Tolstoy, Hemingway and Nietzsche-quoting Super Frog (Keong Sim who also serves as narrator) who teams up with a timid banker (Juhn again) to save Tokyo from an earthquake. It is the stories, delivered with comic-book gusto, that save this from becoming just another poignant boy-meets-girl, boy-loses-girl, boy-gets-girl tale. Cleverly interwoven, they illuminate each other, lightening sadness with humor (the frog is really funny) and despair with the balm of hope. Underneath the deceptively-simple narrative is an examination of some of the deeper issues of life: reconciliation, connection and loyalty. 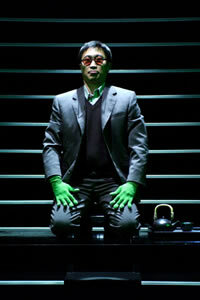 Galati mixes Story Theater technique with dialogue, the actors playing themselves and, in some cases, others, while they switch back and forth from Junpei’s past to the made-up fables. You have to pay attention for the brief (90-minute) duration but it is well worth the effort. Another evocative element is the duo of cellist Jason McDermott and Jeff Wichmann, sitting in a shadowed loft above the stage and playing everything from Andre Pleuss and Ben Sussman’s original music and Schubert to the Beatles’ “Norwegian Wood.” The simple, stunning stage design, hinting at Japanese décor without spelling it out, is by James Schuette and costumes by Mara Blumenfeld. James F. Ingalls did the lighting. It’s all good but the big names of “after the quake” are Murakami and Galati. They go together very well.